BAMS is a novel real-time technique for the rapid identification of individual bioaerosol particles using mass spectrometry. BAMS is unique in that it allows for the reagentless analysis of a complex environmental sample without any prior sample preparation or discrimination. In effect, it offers true real-time (i.e., instantaneous) results from bioaerosols sampled directly from the atmosphere within a large background of both biological and nonbiological particles without the sample preparation required in PCR and other molecular-based assays. Bacillus spores have been successfully characterized and can be efficiently distinguished from other Bacillus spores at the species level, fungal spores, vegetative bacteria, and many other biological and nonbiological background materials in real-time. Indications of the metabolic processes that lead to the creation of Bacillus spores have also been observed. BAMS analyzes individual aerosol particles by single-particle laser desorp-tion/ionization time-of-flight mass spectrometry. Many incarnations of this technology have been demonstrated.37 We chose aerosol time-of-flight mass spectrometry because of its ability to accurately size individual particles, its use of a desorption/ionization laser at 266 nm, and its ability to collect both positive and negative mass spectra simultaneously from the same particle.38,39 The 266-nm laser wavelength is fortuitous because it corresponds to the absorbance maximum of dipicolinic acid, a component of Bacillus spores that constitutes up to 15% of their dry weight. In aerosol time-of-flight mass spectrometry, many particles are introduced into the instrument through a converging nozzle where each is accelerated to a terminal velocity as a function of its aerodynamic diameter. A particle continues through differentially pumped stages until it reaches a region of ultrahigh vacuum. There, it encounters two lasers, spaced a fixed distance apart, that intersect its path. It scatters light from each laser to a corresponding photomultiplier tube. The time difference between the light scatterings indicates the particle's velocity, which corresponds to its aerodynamic diameter and also predicts its time of arrival at the center of the ion source region of a bipolar time-of-flight mass spectrometer. The particle is desorbed and ionized by a Nd : YAG laser operating at 266 nm, and its chemical composition is measured by the mass spectrometer in both polarities. The spectra are reported to a data analysis computer for classification. The data analysis takes place on a separate computer that is capable of monitoring an arbitrary number of mass spectrometers remotely. The algorithm for the analysis of the spectra is similar to the ART-2a and fuzzy c-means algorithm that have been previously used with data from single-particle mass spectrometers.40-43 As the particles are identified, their identities are plotted in a pie chart, and select threat agents trigger a visual and optional audible alarm. Our objective was to demonstrate a technology that could operate autonomously, consume only electricity, and provide species-level detection of Bacillus spores within a background of both biological and nonbiological aerosols. To date we have analyzed more than 20 different growth media, and a thorough study of them is forthcoming; however, LB agar was analyzed to represent growth media for the purposes of these experiments. Simple biological molecules were represented by aspartame in Equal Sweetener, while collagen from Knox Unflavored Gelatin represented purified biological extracts. Mineral aerosols were represented by Gold Bond medicated powder, which contains zinc oxide. The BAMS system was originally deployed to detect Bacillus anthracis in the U.S. mail, and so the above challenge materials were selected because they are widely available white powders that, to the casual observer, might appear to be Bacillus spores. In addition, several bacterial and fungal spores were used to demonstrate specificity of the technique. To demonstrate that our technique could identify the endospores within a complex background, a series of experiments was performed where bacterial spores were nebulized in an aerosol of the other materials. Figure 13.11 shows the results of these experiments, the spectra categorized by the material detected. All three samples were prepared separately, and thus the concentrations of the background aerosols differ between them. Obviously, however, BAMS can detect bacterial spores in a complex mixture. Figure 13.11a shows a mixture of the nonbiological test samples. The large "Other" category in Figure 13.11a results from the large amount of gelatin in the mixture. Gelatin is categorized as "Other" more often than it is recognized, and in Figure 13.11a, 20% of all spectra were recognized as "Gelatin" and 29% as "Other." Figure 13.11b shows the same mixture with Bacillus spores added, along with baking soda and powdered sugar, two previously uncharacterized samples. Note that a large fraction of the particles are called "Other" in response to the addition of the unknown samples. Figure 13.11c shows the mixture with Clostridium cells nebulized into the sample. They were not detected in Figure 13.11b, and fungal spores, which are still absent, are not detected in Figure 13.11c. Although the Bacillus spores run in the tests shown were from B. globigii, separate field tests run at an offsite biosafety level 3 facility have demonstrated the ability of BAMS to recognize B. anthracis from within a complex mixture as well. 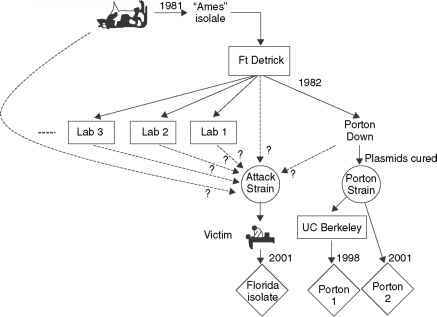 tions presented in this study deal with the detection of biological attack, with future improvements as a single-cell analysis technique, BAMS will also have far-reaching contributions in the fields of oncology, microbiology, and public health.